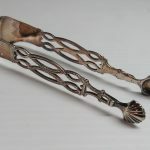 Catherine MacDonald was given her silver sugar tongs as a wedding present from her adoptive mother around 1760 when she married John Currie at Caldwell Manor (Noyan), Quebec. They were cherished by Catherine and subsequently willed through multiple generations of her family. 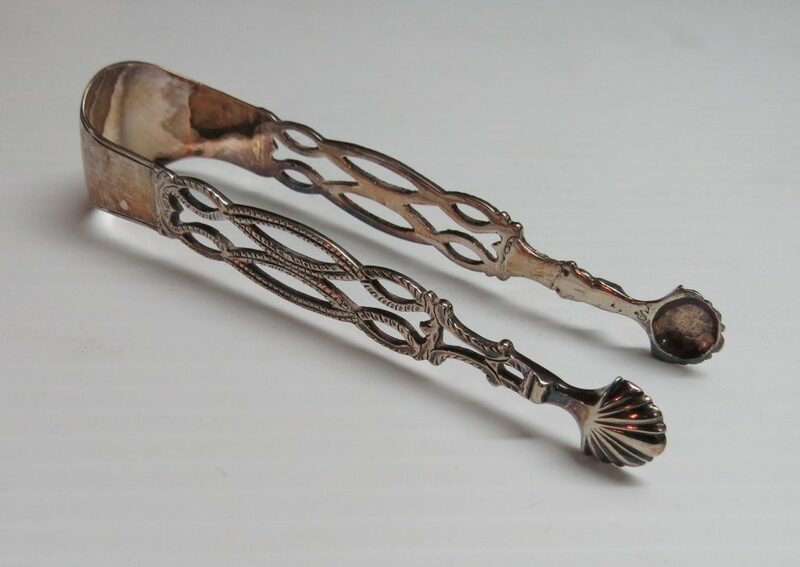 Catherine’s daughter Mary Currie (1775-1801) gave the sugar tongs to her eldest daughter Catherine Westover (1794-1876). Catherine married Henry Rosenberger of St. Armand West (1784-1845) and together they raised seven children including Caroline (1823-1866) and Martha (1838-1908) Rosenberger. The tongs passed to youngest daughter Martha who in turn gave them to her niece Mary Elizabeth Rosenberger (1857-1928). Mary gave them to her daughter Mabel Catherine Smith but since she had no children, Mable gave them to Caroline Rosenberger’s son and Catherine MacDonald’s great, great grandson Charles Ten Eyck (1859-1907) of Dunham. He gave them to his daughter Caroline Julia Ten Eyck (1887-1964) and Caroline then passed them to her daughter Margaret Jane Doherty. In 2018, Margaret’s son Michael Ellis, Catherine MacDonald’s five-time great-grandchild, donated them to the Missisquoi Museum. The passing of this heirloom takes on a wonderful twist when family lore reveals that Catherine, who was born in Scotland around 1740, was kidnapped by Barbary corsairs when she was five years old. The recollections of her childhood reveal that she was playing on a beach with her nurse when pirates stole her away, brought her to New York and then sold her to a woman named Madam Livingston who raised Catherine as her own daughter. The only details Catherine had of her former life was the fact that she spoke with a Scottish accent and her name had been stitched into her undergarments. This simple object with its elegant purpose of dropping sugar cubes into tea represents an intriguing and complex past. During the 18th century, households obtained sugar in large cone-shaped loaves or hats. The expression “I’ll eat my hat,” derives from these conical forms. Pieces of sugar were cut from the hard loaf with a sturdy cutting device called a sugar nipper. Cut pieces were kept in a covered sugar bowl and while the basic design of tongs had been in use for many centuries, adapting them as a practical and dainty means of putting sugar into beverages without having to use the fingers was not done until around the early 1700s. 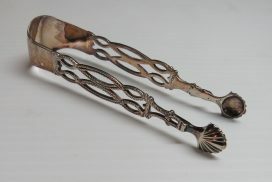 Single-piece cast tongs made of silver bent in a U-shape to form two spring arms were often highly decorated and would include the stamp of the maker in a small logo. Unfortunately an early repair of Catherine’s tongs has obscured the maker’s mark but England produced most of the silver sugar tongs with the majority manufactured in the London area. Etiquette journals of the day instructed women in the making of lump sugar and in the use of sugar tongs and cubes. Directives included advice such as: Sugar cubes are preferable, not only for the ritual of using well-designed sugar tongs, but for their neatness; or There’s nothing messier than spilled sugar granules; and Allow the cubes to rest briefly to dissolve and then stir gently and noiselessly. During the mid-18th century, the growth of the tea market saw a considerable rise in the purchase of sugar, which was commonly used to flavour the tea. The sugar trade was lucrative and competitive throughout the century as Europeans and Americans had gone “sweets-mad.” British sugar consumption quadrupled during this time period and production in the French colony of Haiti increased 40 percent from 1760 to 1791. By the last decade of this century, Britain and France each claimed close to 40 percent of the still-growing commercial sugar market. The sinister side of the sugar craze was the fact that it was facilitated by slavery. The British and French not only controlled the sugar markets but also the sugar-fuelled slave trade. By the mid-19th century, historians estimate that 12 million people had been forced into slavery based on the sugar trade alone. For Catherine MacDonald, her sugar tongs represented refinement and a treasured token of a happy milestone in her life. In the Missisquoi Museum collection, this little object is a signpost of memory and a beginning for a wide range of stories from the past.